The bulk of the collection is correspondence from and to secretary Frederick H. Kingsbury regarding the constitution and bylaws, scheduling meetings, meeting minutes, membership and dues, letterheads and stationary, and the appointment of officers. There is only one set of meeting minutes, from August 1909, located in folder 28. In addition, two major topics of discussion throughout the collection are the exchange of information on undesirable risks among liability insurance companies, and whether first and full medical aid should be a provision of liability policies. A program for and correspondence regarding the third annual meeting, held October 1909, can be found in folder 31. Addresses made at the third, fourth, and fifth annual meetings of the Liability Insurance Association can be found by searching in the Davis Library’s catalog. Hayden’s Annual Cyclopedia of Insurance in the United States 1910-1911. Records of the Liability Insurance Association, 1908-1910, folder 5. Hayden’s Annual Cyclopedia of Insurance in the United States 1911-1913, Life and Miscellaneous Insurance Edition. The Insurance Institute of America (IIA), founded in 1909, is a nonprofit organization offering educational programs and professional certification to people in the property and liability insurance business. They offer programs in both general education in insurance principles and specialized education in fields such as underwriting, claims, risk management, and reinsurance. 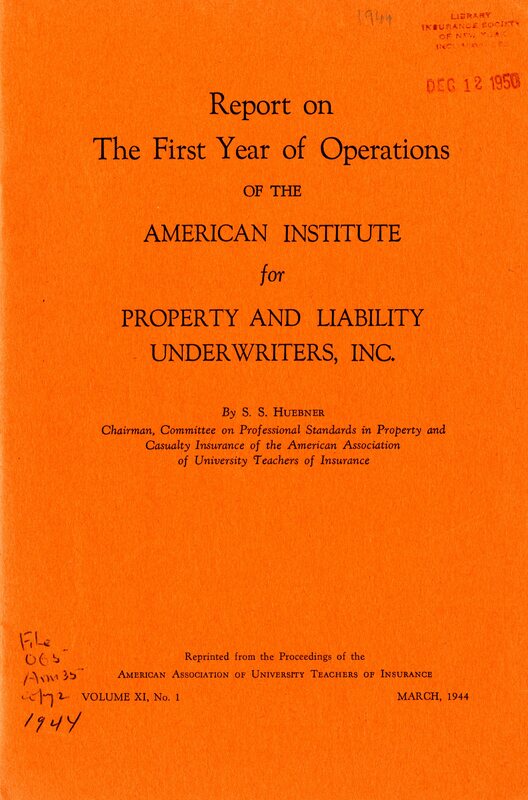 The American Institute for Property and Liability Underwriters (AIPLU) was founded in 1942 by S. S. Huebner and the Wharton School of the University of Pennsylvania. It is an “independent nonprofit organization providing educational programs and professional certification to people engaged in the property and casualty insurance industry.” The AIPLU also founded the CPCU designation in 1942. Dr. Harry J. Loman, a chief executive officer of the AIPLU, helped promote awareness, acceptance, and respect for the CPCU examinations and designation. He was part of the formation of the Society of Chartered Property and Casualty Underwriters (CPCU Society) in 1944, for members who have gained the CPCU accreditation. It has local chapters across the United States organized by regions The Harry J. Loman Foundation was formed by the CPCU Society in 1961. The IIA combined operations with the AIPLU in 1953. They still maintain their separate identities while combining operations and coordinating their educational offerings. The name of the AIPLU was changed in 1992 to the American Institute for Chartered Property Casualty Underwriters (AICPCU). Harry J. Loman was also the first dean, and later, the president, of the AICPCU. The AICPCU and IIA were rebranded as The Institutes in 2009. This collection consists of the records of two organizations, the IIA and the AIPLU. The majority of documents in the collection were created before these organizations changed names. 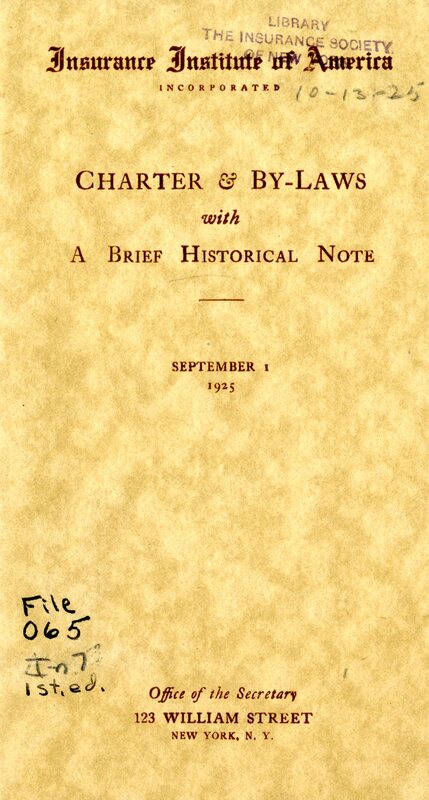 In addition, the collection contains documentation on the CPCU Society and Harry J. Loman Foundation. Most of the records were part of the files of Edward R. Hardy, founding member, as well as secretary and treasurer of the IIA, and Arthur C. Goerlich, trustee and secretary of the AIPLU. Hardy and Goerlich were based at the Insurance Society of New York, and housed their files at the library there. Other documents were gathered by the Insurance Society’s librarians and added to the vertical file collection over many years. All of the documentation on these related organizations was combined into one collection.